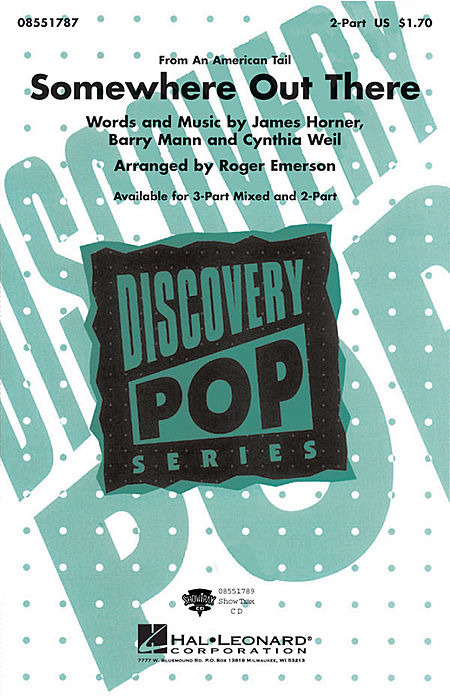 "Somewhere Out There" is a song written by James Horner, Barry Mann and Cynthia Weil. The song originally appeared in the 1986 animated film An American Tail. The hit single was performed by singers Linda Ronstadt and James Ingram. "Candle On The Water" is a simply breath-taking setting for women's voices and "Sittin' On The Dock Of The Bay" is a soulful a cappella rendition of the 1968 #1 pop hit by Otis Redding that's great for pop and jazz groups. From the Beatles' 1966 hit movie and single "Yellow Submarine" is a colorful, fun arrangement and Kirby Shaw does a wonderful job with the beautiful "Somewhere Out There" from American Tail. Linda Maria Ronstadt (born July 15, 1946), is an American popular music vocalist and entertainer whose vocal styles in a variety of genres have resonated with the general public over the course of her four-decade career. As a result, she has earned multiple Grammy Awards, two Academy of Country Music awards, an Emmy Award, an ALMA Award, numerous United States and internationally certified gold, platinum and multiplatinum albums, in addition to Tony Award and Golden Globe nominations. A singer-songwriter and record producer, she is recognized as a definitive interpreter of songs. Being one of music's most versatile, and commercially successful female singers in U.S. history, she is recognized for her many public stages of self-reinvention and public incarnations. Here are 17 of her favorite songs. This song originally appeared in the 1986 animated film An American Tail with the single performed by singers Linda Ronstadt and James Ingram.. The a cappella choral textures communicate the touching lyric and classic melody of this beloved ballad perfectly in a setting that is accessible, yet musically satisfying! Opening with a lyric solo line accompanied by the ensemble, the melody then passes between the soprano and tenor before modulating, and moving steadily forward to the expressive final chords. "Somewhere Out There" is a 1986 song released by MCA Records and recorded by American singers Linda Ronstadt and James Ingram for the soundtrack of the 1986 animated film An American Tail, directed by Don Bluth. It was written by James Horner, Barry Mann and Cynthia Weil with production done by Peter Asher and Steve Tyrell serving as the associate producer.